Wisdom for Miloh: Not all frauds are bad. 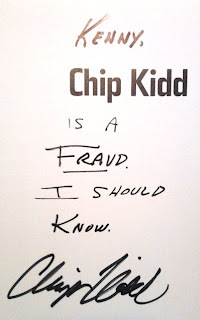 I "met" Chip Kidd about seven years back at a book signing. You can read a bit about it here. The image below is from one of the books he signed. I realize he was just goofing around, or maybe not, but I think there's a nugget of awesomeness. 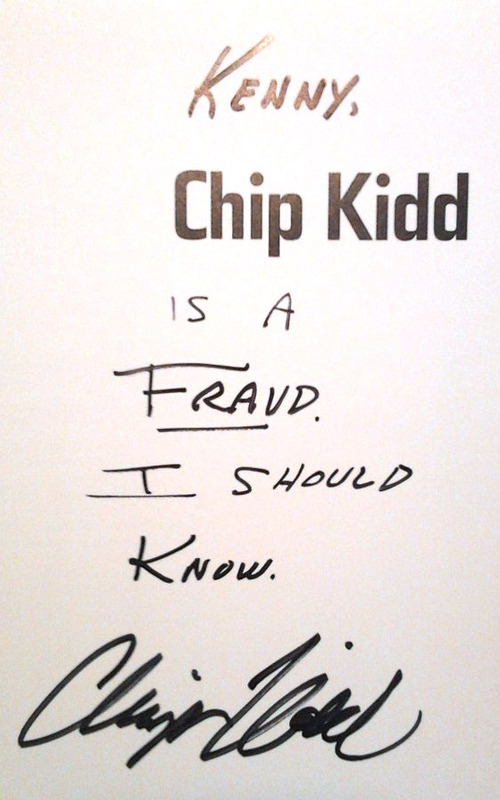 Although I know it would put Chip Kidd in a state of depression for years to hear that he's not my favorite fraud I have to say that P.T. Barnum holds that place in my hear. Phineas Taylor is actually a hero of mine. He was an incredible salesmen... Maybe the best. The dude made a fake Cardiff Giant and then when the "real" Cardiff Giant was found out to be a fake he billed his as the Fake Fake Cardiff Giant... People kept coming to see his fake. He also came up with the "This way to the Egress" signs... Freaking brilliant if you ask me... But if you ask others he's a fraud. That's just the tip of the iceberg of Barnum but I'm not under the gun to do a whole report on him... However, Miloh, when you have to do your first expository report (haven't used that word since 10th grade) I'll make you suggest you do one on him. Barnum, and others, paved the way for modern marketing... What I do... Really it's the same thing he did... Smoke, mirrors, telling the truth in your own way... Yeah being a fraud isn't the worst thing ever.